How can I dye a t-shirt to look like candy corn? Candy corn is a really easy color scheme. Orange in the middle, white on the narrow end, yellow on the wide end. What I would do is presoak the shirt/onesie/whatever in soda ash, wring it out pretty well, lay it out flat, without tying it, and squirt Procion MX fiber reactive dye in yellow (yellow MX-8G, the one both Dharma and Jacquard call Lemon Yellow) on one end, then squirt orange dye (orange MX-2R, which Dharma calls Deep Orange and Jacquard call Brilliant Orange) across the middle. The dye will spread out some, but it doesn't keep spreading indefinitely. If you watch to see how far the orange dye creeps, you can control the amount of dye you put on so that there is not enough to overwhelm the white end. This will also work if you tie the shirt, but watching the dye go on flat gives you a little more control. It's okay if there's a little overlap between the yellow and the orange, but again be careful not to apply so much orange dye that it runs all across the white section. I think you want the orange section to be more than one-third of the total, and the white and yellow each to be less, but start with equal thirds and just see how far the orange dye runs when you drip it onto the shirt. Other colors often end up covering more of the yellow section than people plan on them doing. The reason why I recommend using orange MX-2R instead of mixing an orange from yellow+fuchsia is that yellow and fuchsia tend to separate out at the edges, giving a bit of a yellow halo. It's not terrible, so it's worth trying if you already have a tie-dye kit with yellow and fuchsia dye and don't want to order more dye, but it's not as ideal as using a true orange dye. Another way to get the orange to stay where you want it is to thicken it with some sodium alginate. 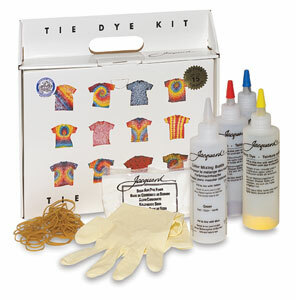 A lot of tie-dyers use sodium alginate to thicken their dyes. Buy it from a dye supplier such as Dharma Trading Company Jacquard Products, or PRO Chemical & Dye. I rarely use thickener, myself, though; it's a matter of personal preference. So I'm looking at the Dharma catalog, and I need to get soda ash, and the dyes. (I figure I'll forego the sodium alginate.) I'm a little confused as to which type of dye I should be getting. Should I be looking at the Fiber Reactive dyes? It's been a while since I've tie-dyed anything; once I apply the dye and it dries on the shirt, do I need to soak it in anything again or just rinse it out? 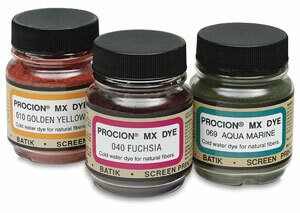 Yes, you want the Procion MX dyes, which Dharma labels as 'Dharma Fiber Reactive Procion Dyes'. You also MUST have soda ash, or washing soda, which raises the pH of the fabric enough for it to react with the dye. Soda ash is the dye fixative, usually applied by presoaking the shirt in a mix of one cup of soda ash in a gallon of water. You can usually buy it at the hardware store as "pH Up", but if you're ordering dyes it's easier to order some soda ash at the same time. If your water is hard you should also order their water softener, which is sodium hexametaphosphate, since hard water otherwise gives duller colors. It's far better than the Calgon water softener you can buy at the grocery store now. If you don't still have them from when you tie-dyed before, also order some plastic squeeze bottles with yorker tips. Don't forget to get some disposable gloves, too.